See what people are saying about our English Cream Golden Retrievers, direct from our Forever Families. We can’t express how much God has blessed us with this boy! We lost our 2 males, Ferdinand and Columbus last Feb and June 2017. Both of us were devastated with such sorrow. Max was at our house being trained when we had both boys and they each adored him. They took him under their wings as if to say, this is what they will need, when we are gone. Max is not a replacement for either of them. He is such a bright and shining star to us with his constant smile. He loves to give us hugs, which is wonderful! Majestic Manor Goldens is an honest breeder and they stand by their word. I have been breeding with another breeder in MI, so I’m very adverse on what dog breeding should and should not be. I feel like Connie and Cayla are part of my family now and that’s wonderful to have friends like them. Our Granddaughter is now using Max as her first 4H dog and she is loving it! How do we Love Thee – to the moon and back again! Hi Majestic Manor Family- Our experience was truly amazing with finding our Ivy her furever home. You have a beautiful setting there in Westfield IN. We pulled in and just knew the pups and dogs were in a great setting. We had Ann train Ivy for 2 weeks prior to her coming home to us. She has been an extremely laid back, well behaved puppy and had no accidents ever in our house. We did have some trial and errors trying to manage her sensitive stomach but found a great patient vet who helped us find the right food for her. We love our 2 year old girl just as much as our own 2 kids!! My daughter who is a freshman at UK misses her dog more than us. Thank you truly, from the bottom of my heart for such a sweet healthy dog who we adore immensely. I have gotten so many compliments when I’m out walking her on what a beautiful dog she is. I have recommended MMG to all of my friends. I hope this helps bring a smile to your faces seeing one of your fur babies. Thank you again for all you do for this breed, and all the wonderful beautiful puppies you bring into this World. The moment we met our pup we were 100% positive he would fill our lives with pure love and happiness. He hasn’t disappointed! What a perfect addition he’s been to our family. His temperament is phenomenal! He’s intelligent, devoted, respectful, perfect with our children and small pets. He mastered the A.K.C. 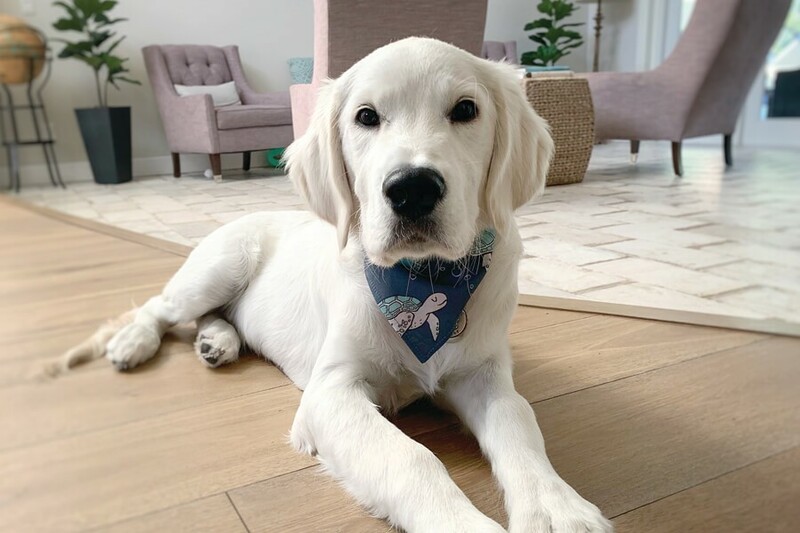 star puppy test at just 4 months old and is currently working on earning his canine good citizen. Our goal is to have him complete the therapy dog requirements so he can visit the children’s hospital and the veterans hospital. 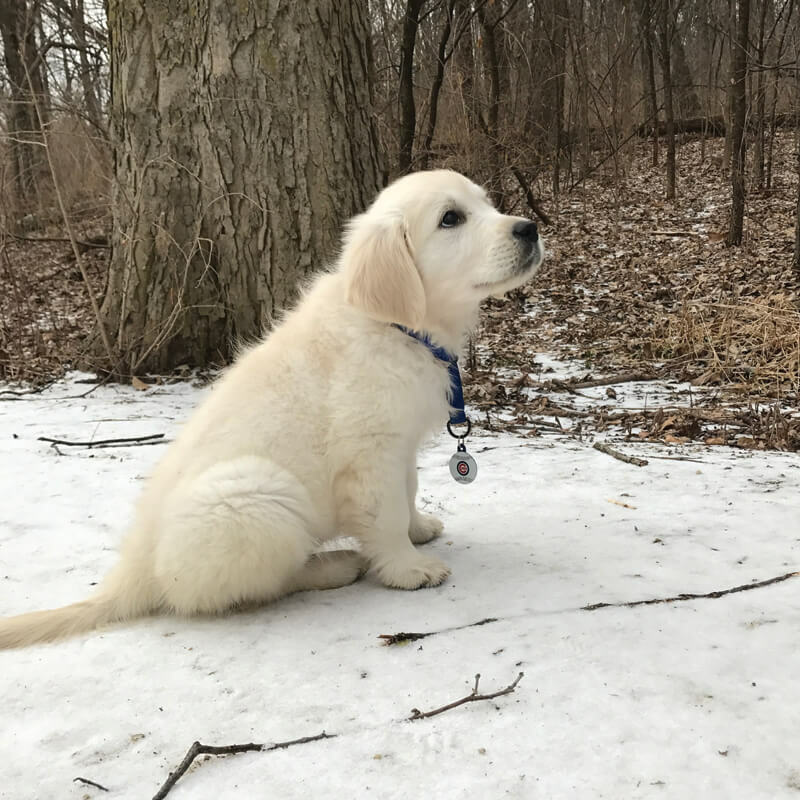 Based on his progress at just 6 months old, the skies the limit for him! We couldn’t have asked for a better best friend and we’re looking forward to adding another MMG pup to our family in the future! We’ve had nothing but great experiences with the entire team! Tucker really is an amazing dog. I have had many Golden retrievers over the years and he is one of the smartest and sweetest dogs. He is a very quick learner, aims to please you at all times, loves people and other dogs, and is just plain beautiful! He only chews on his toys and at five months old he still has not destroyed anything in our house. That is a first for a golden retriever puppy in our house. 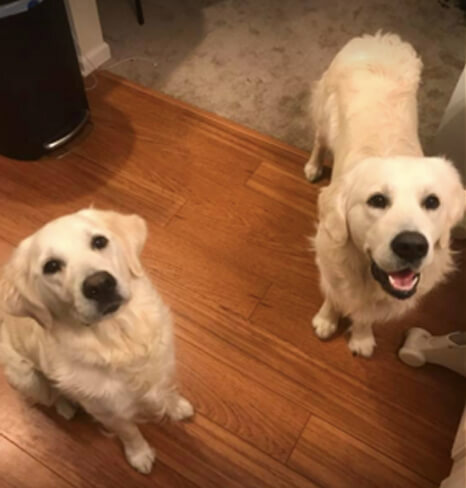 We will absolutely come back to you guys to get our next English cream golden retriever! Thank you for the most amazing family member, Tucker! Majestic Manor is so much more than an average breeder. Let me start by saying this: I did not want a dog. I was a single, struggling teacher just trying to make ends meet and live on my own for the first time in my life when tragedy fell on my family. My mother passed away unexpectedly of a heart attack at home. My life came to a halt and the void in my heart became unbearable most days. My students helped carry me through the tough days by simply keeping me busy and giving me purpose. One student was particularly dear to my heart, and I became very close with her family - as you may guess, the Deasons. Connie began planting the seed that I would love one of their English Cream Golden Retrievers. I initially declined as I did not feel I was in a good place emotionally to take on a puppy, but Connie knew better. What I didn't understand at the time is that the Deasons also know what it means to be grief stricken to the point that it's hard to get out of bed. She knew how much I needed one of their dogs, even if I didn't. If you've met Connie, she can be very persuasive! We agreed on summer while I'd be done with school. I'll never forget the day we went to pick up "Winnie". I think we held her for an entire twenty-four hours. Aside from being in charge of a living, breathing animal - I started to see my life change. Laying in bed all day was just not going to be an option for Miss Winnie. She forced me on walks, forced me to play and laugh, forced me to love. It was the best therapy anyone could offer. Fast forward to a husband, a new house, a new baby, AND a new fur baby (we also now own Winnie's son, Crosby) I couldn't imagine life before my dogs. As my grandma says, "they just have such kind faces" and their temperaments are incredible. They love on my son like he is part of their pack, and the neighborhood kids will ring the doorbell asking "if Crosby and Winnie can come out and play". I want to give back on this gift that MMG gave me some day. I hope to certify Winnie and Crosby as therapy dogs so they can service the students in my community to help them cope with disabilities, disorders, and anxieties. So many of them deserve love, licks, and loyalty ~ we all do. When I found MMG's website I didn't just get a puppy, I gained a forever family. Ice is sweet, smart, loving, beautiful, and the most well socialized dog I've ever seen. 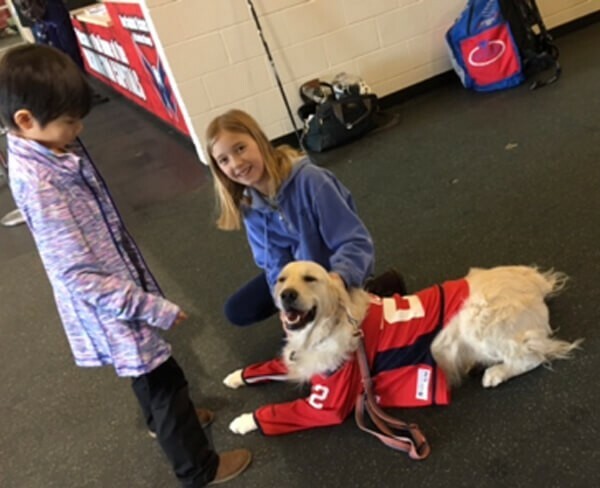 It doesn't matter whether he is working one on one with my blind children's charity, or in a stadium full of fifty thousand people and dogs, he is always calm, sweet, friendly and never nervous. Ice is my ray of sunshine every day and I couldn't imagine my life without him. Duke came into our family in a bit of a “non-traditional” way. Friends of ours had purchased the puppy, only to find they struggled with allergies that they were unaware of. We offered to babysit Duke in the interim and instantly fell in love with him. We also have a lab and was not necessarily in the market for another dog. Yet this sweet dog and his even sweeter disposition could not be passed up. Duke came over for a playdate, and never returned home. Fortunately, Duke’s “first” family is able to see and love on him often, without the misery of continuous allergies. 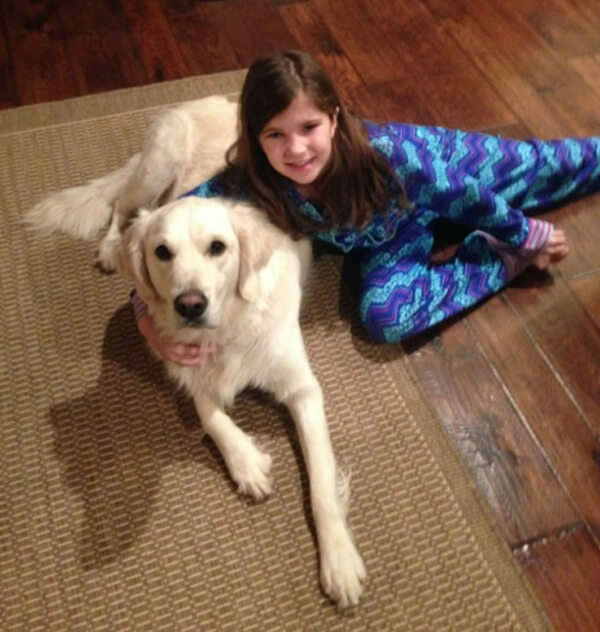 And our family has been able to provide Duke with a loving home, filled with kids and another dog, to keep him happy. Even though Duke started his first months with another family, he transitioned into our family seamlessly. His instincts are something you would see in a movie. Our youngest daughter has a seizure disorder. I had always heard of how dogs have incredible senses, but Duke has proven that to be very true. One night Duke was pawing to get into our daughters room after she fell asleep. This was very unusual behavior for him, as he would typically be up with the rest of the family. I let him into her room and he would not budge from her bedside. I called him repeatedly and he sat at attention by the head of her bed. After deciding he was going to win, I let him stay there. Only to learn later that our daughter was slipping into the beginning stages of a seizure, and Duke was by her side. The love we have for this dog cannot be measured by any terms…. Duke is simply an amazing dog and is meant to be a part of our family!! My wife and I added a MMG puppy to our family a year ago, and we simply could not be happier with our pup, Hank. Very early on in the process, Connie and Cayla were both so incredibly helpful and caring, even allowing us to visit early and tour the kennel as well as meet the parents of the litter. 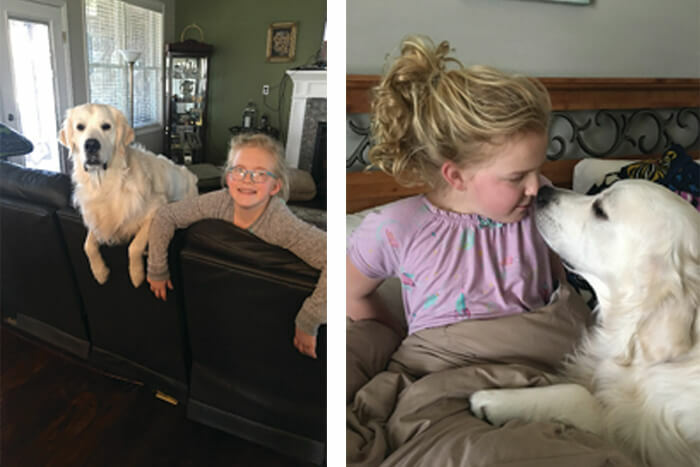 When it came time to pick, Connie and Cayla had a detailed profile of each puppy and helped us pick out the personality that would best fit with our family needs. Our pup, Hank, really was the “total” package. 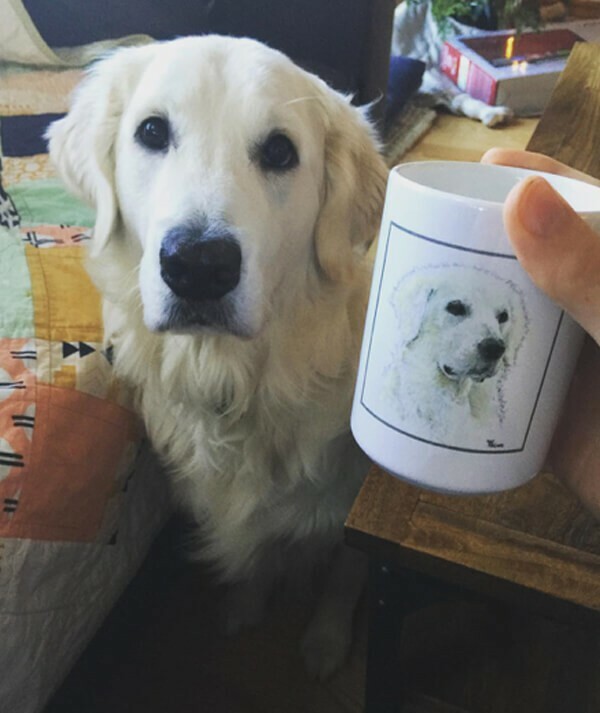 A loving, friendly, and loyal dog — with the handsome looks of a champion English Cream Golden. If I could describe Hank in one word, it would be happy. His temperament was exactly what we hoped for, exuberantly friendly and fiercely loyal. His big block head, and soft kind eyes meet us at the door every time we come home with a thunderously wagging tail. 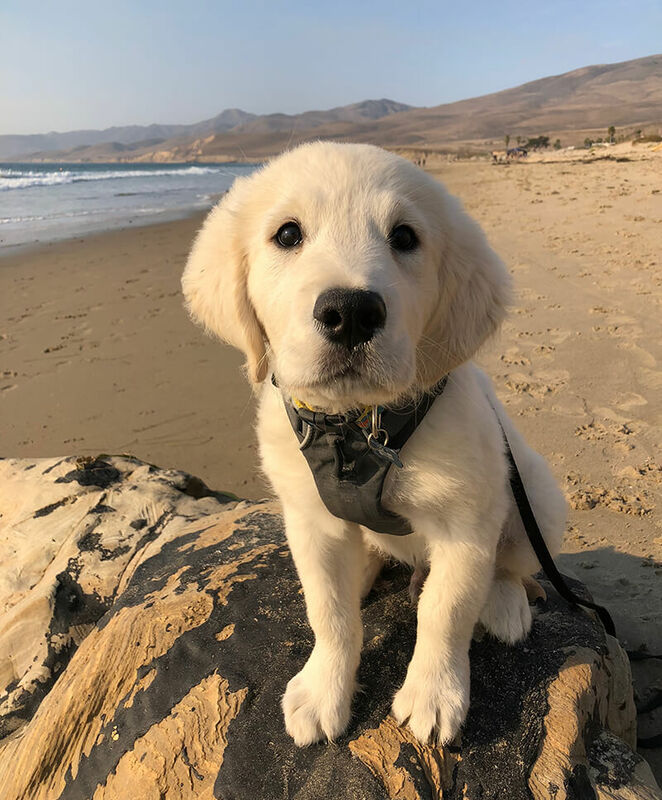 Hank’s favorite things are to go on long hikes with us and his “sister”, cuddling in bed at night and helping find any loose socks around the house… We are so grateful we found Majestic Manor Goldens, and owe a big thank you to Connie and Cayla for making our family whole!